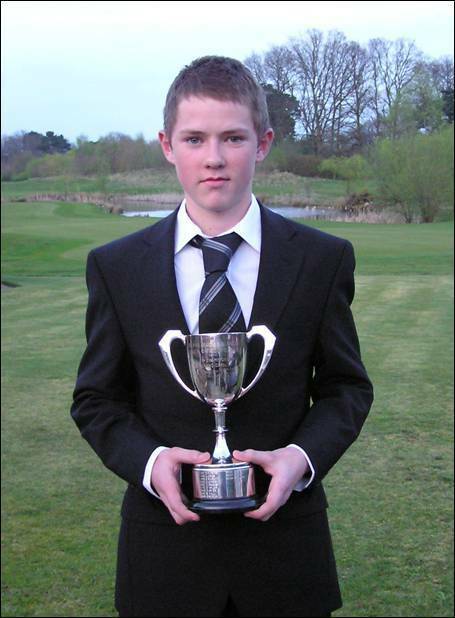 The 2009 golf season is now underway and we have our first Champion in Luke Williams (Hadden Hill) who won the Junior Championship at Mill Ride on 9th April after an incredible 3 hole play off with Tyrrell Hatton (Harleyford). This event was the first that counted towards the Junior Order of Merit that was won by Jake Canning (Stoke Park) last year. 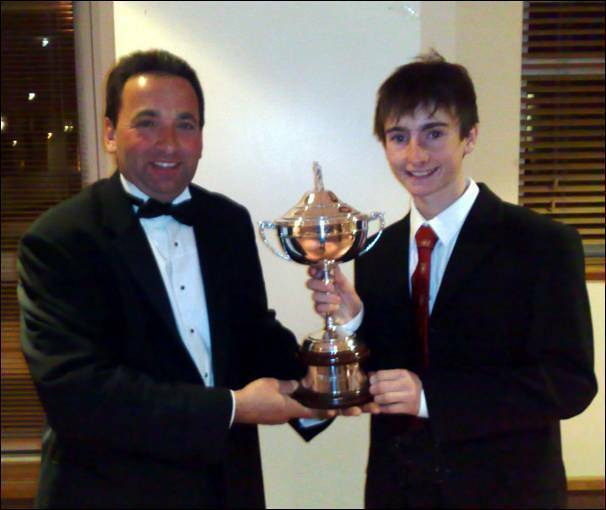 We have also had some excellent National results with Max Smith (Newbury Racecourse) winning the McEvoy Trophy at Copt Heath and David Lane (Goring & Streatley) adding yet another title – this time the Italian Seniors Championship – to his long list of successes. We have had a couple of friendly matches which have given our new County Captain, Malcolm Reid, a good insight into his probable 1st Team. We are looking forward to a successful season at all levels and hope that the effort put into winter coaching will pay dividends this year. Our Golf Partnership continues to thrive and my thanks to all those involved for their unbelievable commitment to ensuring that we introduce as many people to our great game and encourage players to take up club membership. The County Card scheme continues to prosper and we now have over 700 Clubs participating all over Southern England. Soon we soon hope to announce that the scheme will encompass most of England. At just £15 for 2009 it represents a real bargain and most participating clubs welcome Card Holders at the Members’ introduced green fee rate. Details are available from your Club Secretary or from our website. Best wishes for good golfing in 2009. Team at Burhill: Steve Barwick (Stoke Park), Adam Birdseye (Hazlemere), Craig Buttivant (Gerrards Cross), Craig Hinton (The Oxfordshire), Tom Lawson (Ellesborough), Ashley Walton (Frilford Heath), Nick Woodage (Donnington Grove), Adam Wootton (Oxford City). A better performance followed against Dorset at Frilford Heath on 26th April. 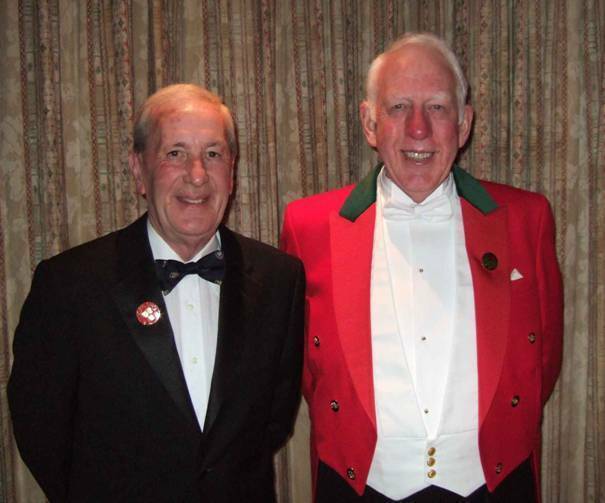 We took the morning foursomes 2½-1½ with Carl Corbin and David Ryles recording a big win in the first game. The afternoon singles were shared and we just crept home 6½-5½. Carl Corbin had time for another 18 as his 2 wins only took him 25 holes to complete! Team at Frilford Heath: Sandy Bolton (Magnolia Park), Carl Corbin (Wokefield Park), Matt Foster (The Oxfordshire), John McNally(Stoke Park), Ben Paterson (Frilford Heath), David Ryles (Mill Ride), Luke Williams (Hadden Hill), Dean Wright (Reading). Team at Wellington College: Will Cooper (Woburn), Robert Harrhy (Frilford Heath), Dean Newbold (Frilford Heath), Joe Richardson (Frilford Heath), Josh Stanners (Hazlemere), James Tobia (Woburn), Luke Williams (Hadden Hill), Ben Woolford (Woburn). A good day at Newbury & Crookham on 5th April resulted in a win for the Juniors against Hampshire. Unfortunately Wiltshire were not able to raise a team again for this annual fixture which may cause us to look at the future of this match. For a change we got the better of Hampshire and came home in style winning the last 3 games to take the match 6-4. Team at Newbury & Crookham: George Abbott (Chiltern Forest), Chris Aubrey (Caversham Heath), James Butterworth (Harewood Downs), James Cooper (Wokefield Park), Will Cooper (Woburn), Ali Court (Reading), Rob Pennel (Castle Royle) Matt Robinson (East Berkshire), Alex Stubbs (The Oxfordshire), George Wilson (Woburn). Team at The Lambourne: James Brockington (Henley), Jake Canning (Stoke Park), Dean Newbold (Frilford Heath), Steven O’Connor (Tadmarton Heath), Joe Richardson (Frilford Heath), Josh Stanners (Hazlemere), Ollie Tite (Witney Lakes), James Tobia (Woburn). 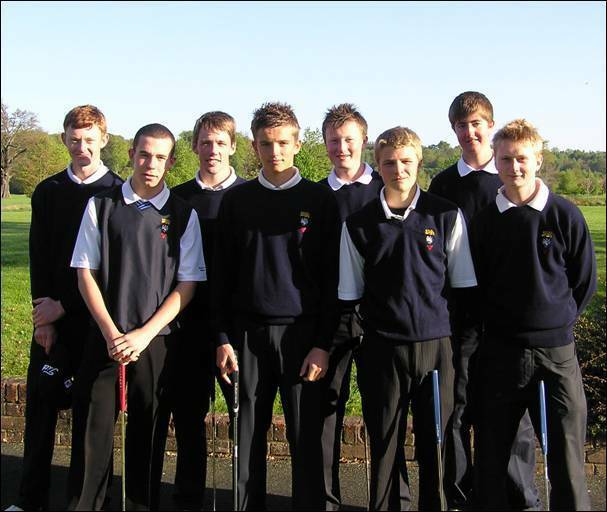 The BB & O Junior Championship was played at Mill Ride Golf & County Club on Thursday 9th April 2009. 60 Boys aged 18 and under contested the Championship on the testing layout playing over 6,800 yards. Weather conditions were reasonable but we did have some rain which surprisingly gave a number of players a few problems. Some of the leading contenders had indifferent morning rounds putting them well out of the running. Leading the way with an outstanding score of 71 (1 under par) was Luke Williams (Hadden Hill) who was 2 ahead of England Boys International Squad member Tyrrell Hatton (Harleyford). Jordan Mann (Sand Martins) and Robert Harrhy (Frilford Heath) were a further 2 shots back with Sandy Bolton (Magnolia Park) and Steven O’Connor (Tadmarton Heath) not out of contention after rounds of 76. The conditions in the afternoon improved a little as did the scoring as the players got to grips with the course. After 9 holes things had tightened up as Luke dropped a shot on the outward half. He was now just 1 shot ahead of Tyrrell Hatton, with Sandy Bolton chasing hard as he turned in 2 under par. Steven O’Connor was also in with a shout as he turned at 1 under par. After 15 holes Tyrrell held the upper hand on level par for the round. Sandy & Steven had slipped out of contention and Luke was a shot adrift of the leader. His excellent birdie four at the difficult 18th enabled him to tie and force a playoff over 3 holes for the title. Both players hit the long par 3 15th but it was Luke who holed his putt to take the lead. A big crowd then saw a spectacular 2nd shot from Luke at the 16th from about 60 yards which went straight in! Tyrrell’s 2 excellent pars now resulted in him being 3 shots adrift. He bravely made a great birdie at the last but this was not enough to stop Luke from clinching the Title after a splendid day’s golf. Steven O’Connor took 3rd after a countback from Sandy Bolton. 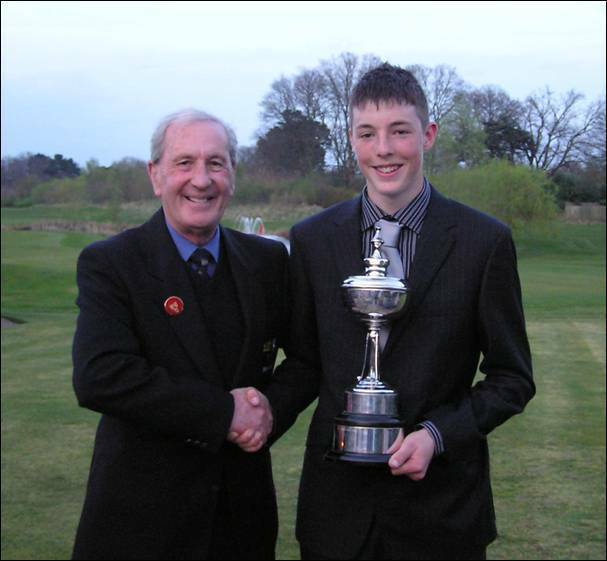 Sam Williams (Castle Royle) took the Under 16 Title with his score of 150. 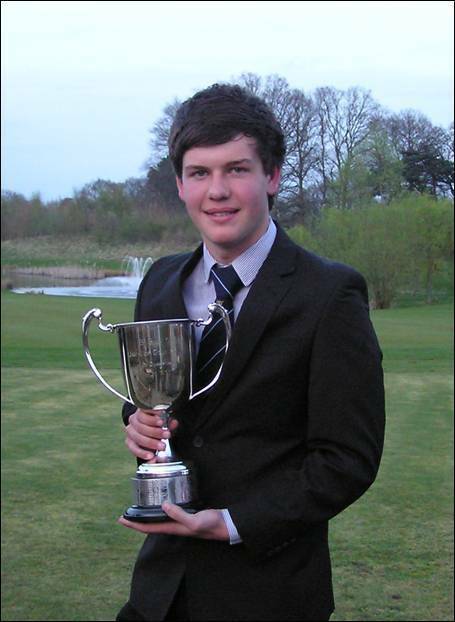 Ben Conway (Reading) won the Handicap Trophy with net 143. Our thanks to Mill Ride Golf & Country Club for allowing the Boys to play on such a challenging Championship layout. James Butterworth (Harewood Downs) won the Boddington Trophy in 2008. This award, given by the Honourable Company of Oxfordshire golfers is to the most improved Junior in BB&O. 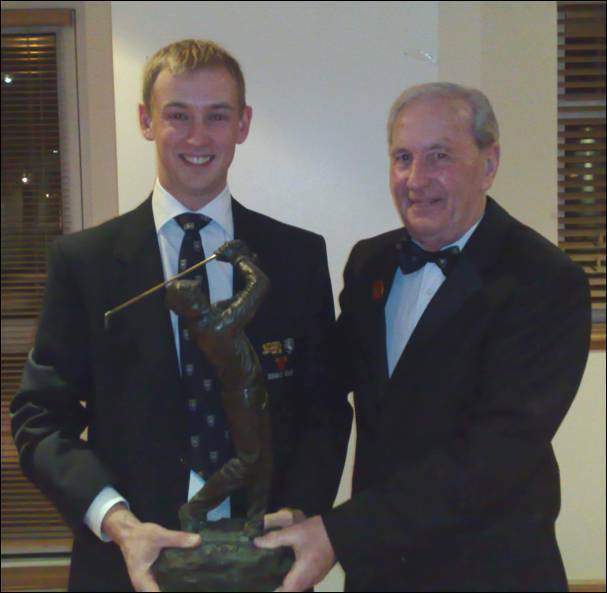 Adam Birdseye (Hazlemere), was the Captain’s choice to receive the Player of the Year award and Ashley Walton (Frilford Heath) won the Order of Merit Trophy. 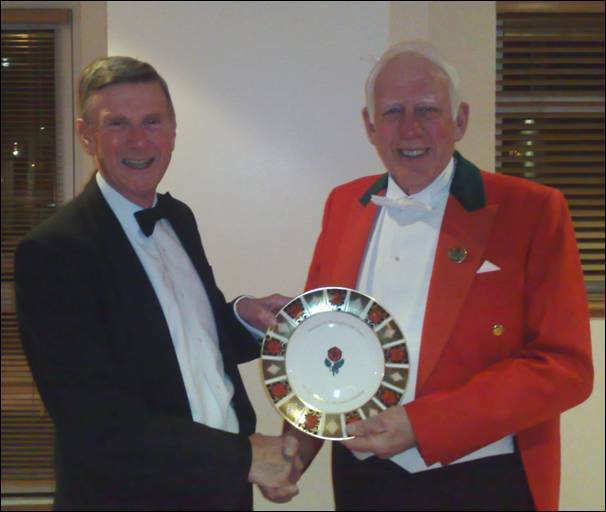 Ashley Walton (Frilford Heath) receives the Order of Merit award. A turnout of over 50 attended the Annual Council Meeting on 26th March. Iain MacCaskill highlighted the achievements of the year and the County Secretary/Treasurer presented the Annual Accounts which were approved. In accordance with the Notice sent to all affiliated clubs in November 2008. 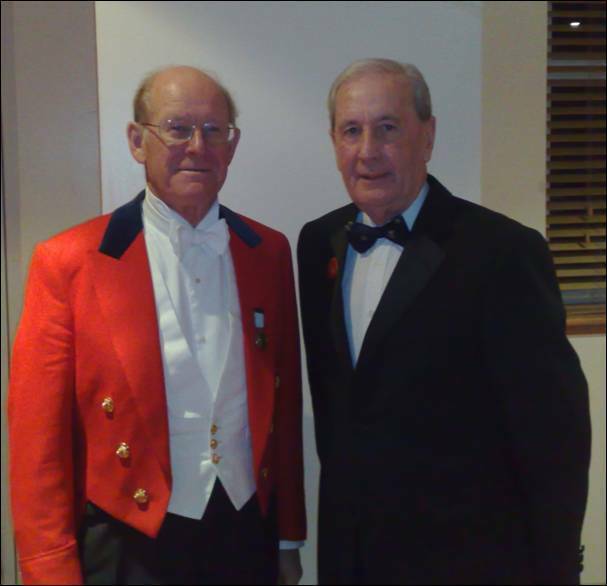 Mr D M Forbes (Sonning) and Mr J Cameron (The Oxfordshire) were unanimously elected to the Executive Committee. 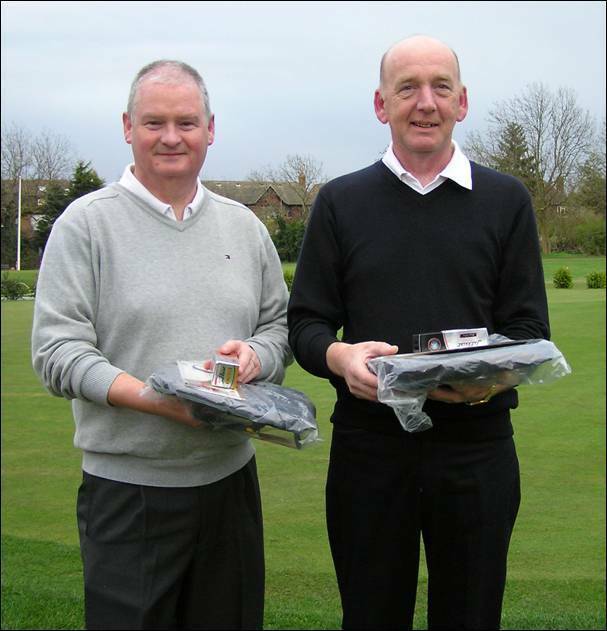 Gerry McIntyre and Dave Brudenall (Wexham Park) were the worthy winners of the first 'major' of the year as they took the afternoon Greensomes by just one point from the chasing pack.